Prime Minister Narendra Modi addresses reporters outside parliament in New Delhi. Prime Minister Narendra Modi had a word of advice for lawmakers today as he walked to parliament on the opening day of the winter session. "I hope members will spend their time in the house for the welfare of the people, not for themselves or their parties," PM Modi said as early leads of the assembly election results in five states started trickling in. The winter session of parliament is likely to see a united opposition piling up pressure on the government on a range of issues, such as the exit of RBI governor Urjit Patel, rumblings in the CBI and the Rafale deal controversy, while parties like Shiv Sena are set to make a renewed pitch for Ram temple in Ayodhya. "This session is important; many issues of public importance will be taken up. I have faith that all the members of the parliament will respect this sentiment and move ahead. Our efforts are that discussions are held on all issues," PM Modi said. "Let there be differences but we should at least have a dialogue. I hope that we work more than the stipulated time this time," he said. The start of the session coincides with the counting of votes for assembly elections in five states, seen as the semi-final battle ahead of next year's national elections. The ripples of the outcome will be felt inside the house today. 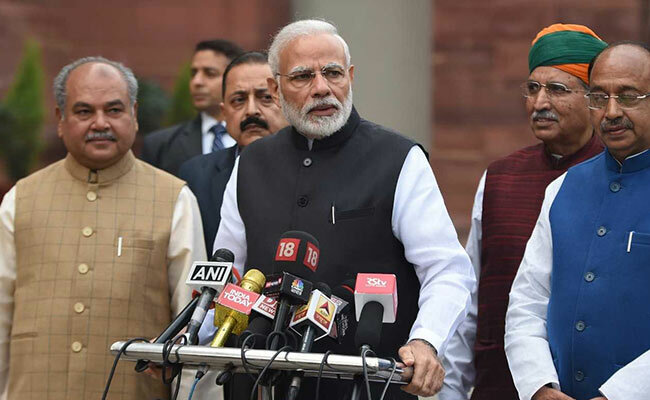 At an all-party meeting on Monday, PM Modi had said the government was ready to discuss issues of national importance in parliament, and the opposition must ensure the house works smoothly. Over a dozen opposition parties, barring the Bahujan Samaj Party (BSP) and Samajwadi Party (SP), held a meeting separately with a larger goal to form a mahagathbandhan or grand alliance to take on the PM Modi-led NDA in 2019. This unity among opposition parties is likely to reflect inside parliament as well. A good performance by the Congress in Madhya Pradesh, Rajasthan and Chhattisgarh, all ruled by the BJP, will significantly enhance the party's confidence in taking on the government on various issues. A good performance by the BJP will help it in blunting opposition attacks and pushing for pending laws. The BJP is likely to highlight the government's role in bringing the alleged middleman in the Rs 3,600 crore AgustaWestland chopper deal, Christian Michel, from the UAE, as well as a favourable verdict in fugitive businessman Vijay Mallya's extradition hearing in a UK court. The "infighting" in the Central Bureau of Investigation involving two senior officers, Alok Verma and Rakesh Asthana, is also likely to figure in the opposition's attacks.